NFL football has become synonymous with Thanksgiving, nearly as much as turkey and stuffing, but where did it all start? Why do the Detroit Lions and Dallas Cowboys always host games on turkey day? Every year since 1934, the Detroit Lions have taken the field for a Thanksgiving game, no matter how bad their record has been (with the exception of World War II), and the tradition can be traced back to George A. Richards. Richards owned an NBC radio affiliation and he negotiated a deal to broadcast the Thanksgiving Day game across the country. Richards used the game as a marketing ploy to attract fans to the stadium. Richards also owned a radio station that was affiliated with NBC and he negotiated an agreement with NBC to broadcast the Thanksgiving Day game across the country. 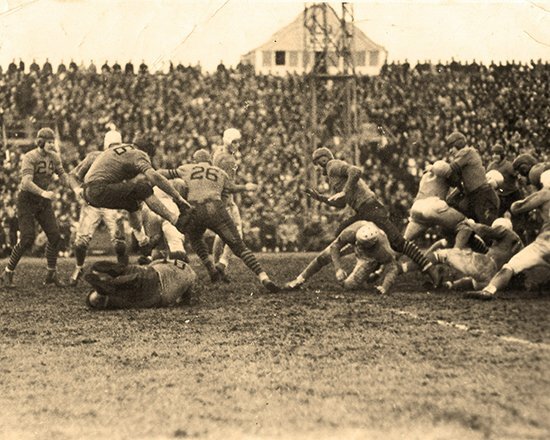 In 1934, the undefeated Chicago Bears rolled into town as defending NFL champions, and since the Lions had only one loss, the winner of the first Thanksgiving game would take the NFL’s Western Division. The Lions not only sold out their 26,000-seat stadium, they also had to turn fans away at the gate. While the Bears won that game, 19-16, the tradition took hold, and the Lions have been playing on Thanksgiving ever since. Just so you know, Bronko Nagurski threw a game-winning touchdown pass to Bill Hewitt to win the game. In the 1960s, the NFL wanted to expand its television offerings on Thanksgiving Day. The Dallas Cowboys team president and general manager Tex Schramm jumped at the opportunity as long as they were guaranteed home games each year. Schramm’s background was in broadcasting and marketing and he bet that playing on Thanksgiving Day would give his team increased national exposure. And how are the Cowboys recognized? As America’s team. The success was immediate, with the first Cowboys’ game on the holiday in 1966, a team record crowd of 82,259 fans gathered at The Cotton Bowl to see the Cowboys beat the Cleveland Browns, 26-14. It was Don Meredith throwing a touchdown pass to Dan Reeves and Don Perkins running for another (a total of 112 yards) to go with four field goals to get the Cowboys the win. The NFL has dabbled with letting other teams host home games on Thanksgiving, but the Cowboys are the big draw. In 1975 and 1977, the NFL gave the big game to the St. Louis Cardinals who last badly both years, so the Cowboys were back in the spotlight. Just to be thorough, it should be mentioned that in 2006, the NFL added a third game to the Thanksgiving lineup. This game is not assigned to a specific franchise, airs on ESPN to capitalize on the growing popularity of football as America’s “new” past time.